Presenters in peril – is Twitter to blame??!!! Not showing off – just illustrating a dilemma! On Twitter today Scott Thornbury raised an issue that is of increasing concern to those of us who speak at a number of international conferences. And since I, like many others, feel partly responsible, and because I, too, have the same ‘problem’ it seems worth talking about here – to see if anyone has a solution to this conundrum. Yesterday morning Scott gave a really good talk called Six big ideas and one small one at the DOS (director of studies) conference of the International House World organisation. It was fabulous conference of a great worldwide organisation (I should declare an interest; I am a trustee of IHWO). I tweeted out the main points of Scott’s talk. This was partly a homage to a terrific act, partly a way of making notes for myself (and a record) and partly the thought that other people out there on Twitter who weren’t at this small conference might like to hear a reasonably clear account of what Scott was saying. (I was not the only one: @shaunwilden and @ihDubai amongst others tweeted the content of the talk too; you can read our comments on twitter by checking #DOSconference). And the session was filmed and will soon be available online. 1 have we – and the filmers – ruined Scott’s life? Does the fact that talks are tweeted and that films of them can be seen all over the place mean that the talks can’t be used anymore? In other words, can Scott do his Six big things and one small one talk anywhere, ever, again? 2 Do tweets out of conferences really inform people who are reading the tweets or are theyjust ‘mood music’ for people who can’t attend? I have concentrated on Scott Thornbury because he raised the issue. But it’s a real issue for me too – and for many other presenters out there. For example, a film of a whole session I did in Santiago in Chile went up online; can I continue to use those activities, or have too many people seen them on film now? Or perhaps people don’t watch the whole film through anyway – and even if they do they don’t remember much! So that’s it. More than two questions. But I hope you see our dilemma. What it feels like to be surprised, very surprised! In my blog I have tried, so far, to address general issues to do with presenting, conferences, writing abstracts etc etc. As with every other blogger, my ‘thoughts’ have been personal, of course, but I have tried to exercise some dispassion. But not this time. Just for once I want to tell you how I feel – or rather what it felt like (and then see if there is anything to learn from that). What I am trying to say is that this post is going to be incredibly personal, and I hope you will forgive me for that. This is how it goes: I was sitting on a train from Penrith (in the North West of England) to London. The route traverses the Pennine Hills, and as I looked out of the window I was awestruck by the beauty of the landscape, the young lambs, the hills, the green. It was the kind of scenery to make you feel glad (unaccountably, I often think) to be alive. The day before I had lead a workshop at International House in Newcastle, and then spent the evening with my brother and his partner. As a result I was feeling – how shall I put this – not the healthiest I have ever been. Nevertheless, the lovely scenery and the fact that I was going to meet up with my daughters in London to celebrate my birthday contributed to a general feeling of hazy-headed contentment. And then I got a text message from my friend Petra Pointner. It read “Log on to Twitter! Right now!! !” So I did. if you are one of the people who organised or joined in with my ‘surprise birthday party’ (#JHsurpriseparty) I want to tell you how absolutely wonderful (I need to repeat that…ABSOLUTELY WONDERFUL) it was to be on the end of all that positive, kind, funny, silly, and totally uplifting energy. I was sent pictures of birthday cakes and lasered dogs (really), of modified book covers, of hugs and kisses, of foods, and links to youtube clips and songs – and even of Greek primary kids saying ‘Happy Birthday Jeremy’. There was a Voxopop site of people leaving messages. There were messages and messages and messages. I can only hope that all the people who organised and took part in this joyful ambush experienced as much real and profound pleasure from it as I did. I mean that. Speaking personally I have never really known anything quite like it. My caption for the day? Hate the age, love the birthday! Is there any more to say about this? Yes, I think there is. Firstly, in one of the sessions I do on teacher observation I say that we should spend much more time telling teachers how good they are, rather than identifying their weakenesses – and that complimenting teachers (something that doesn’t happen too often) may have a more profound effect on those teachers’ development than any manner of training sessions and observations. To be suddenly surprised with the kind of positive affection that I experienced – however and in whatever spirit it was given (I am not, I think, totally naive!) – makes you feel great, and as a result you go to what you are going to do next (like teaching a lesson or arriving in Cairo for a meeting) with a renewed sense of energy, commitment and enthusiasm. Then there is the power of social networking – in this case the power of Twitter. How extraordinary to be able to ambush a slightly hungover traveller sitting on a train in the middle of nowhere as if a hundred people had suddenly turned up at his door carrying cakes and ale and singing at the tops of their voices. How wonderful to be able to ‘make things happen’ without the paraphenelia of, well, anything. Perhaps Gavin Dudeney and Nicky Hockly (amongst others) are right. We are the mobile generation. What could those creative actions be? Conferences, VIPs and equality – a corrective? It seems to move in waves or stages – the Blogosphere, I mean, and the Twitter flock. One minute it’s all peace and love (and lots of mutual support and mutual ego-stroking), and the next people are ripping bits off each other and everyone’s outraged and hurt. And suddenly, too – and serendipitously, issues and topics coalesce and something which is worth talking about floats, briefly, around our virtually real world. What am I talking about? I’m talking about conferences and inequality and VIP speakers. All that. Because recently people have posted in near ecstasy about the ISTEK conference in Istanbul, the IATEFL conference in Harrogate, and the HUPE conference in Croatia. And all seemed well with the world. Except, apparently, it wasn’t. Other voices have now been raised; voices which suggest that conferences are elitist and excluding, run by conference organisers who are working to their own agendas and advancement rather than for the good of the teaching body as a whole. Meanwhile over on another blog a VIP speaker of considerable standing and intellect has articulated the familiar quandary of the invited outside speaker, namely whether such encounters (foreign ‘expert’ jetting in to an educational reality that he or she knows little about), are justifiable or desirable. Do most ELT conferences favour the outside VIP at the expense of local and/or less senior presenters? Do VIP speakers get preferential treatment? Are conference organisers just ‘in it for themselves’? Are conferences just money-making vehicles driven by a rapacious publishing industry? 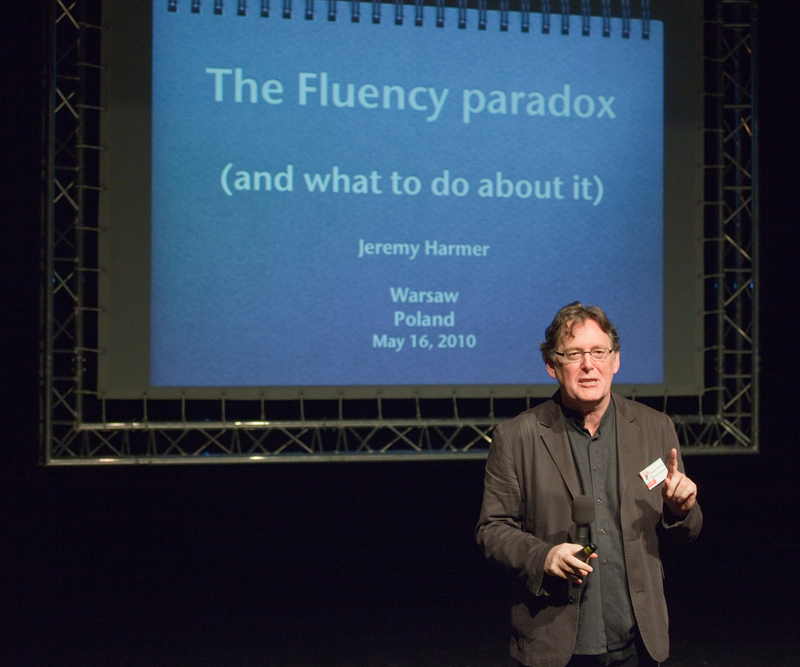 – Most conferences invite outside ‘name’ speakers. There are, as far as I can see, three reasons for this. The first is that the speakers have some kind of reputation as a result of their writing and/or other work and the conference organisers think/hope they will have something interesting to say; the second is because they have gathered a reputation as presenters; and the third (and this is a really big one) is that conference organisers hope that they will bring in the crowds. For without those crowds the conference will be a failure, both economically and emotionally. Does this disadvantage local and more junior speakers? Are ‘name’ speakers getting unfair breaks? Well it depends. Most plenary speakers, for example, have been at it for years (and sometimes for years and years! ), honing their craft after a lifetime of giving little workshops in back rooms and to small audiences. They too, in their time, started out offering sessions to tiny groups far away from the conference bright lights and big stars. And just like all the other speakers, they offered their experience with a mixture of a genuine desire to share and a big wish to impress. A mixture of service and ego. But, and this is a big but, those outside names have never been, in my experience, the whole conference (unless it is specifically organised that way). At almost every conference I go to, there are workshops going on everywhere, often by first time presenters, and in the main, by local speakers (I mean people living in the region). A good conference mixes the two, and well-organised associations like IATEFL have specific scholarships for first-time presenters. Furthermore, as with TESOL, talk abstracts are frequently ‘blind-read’ by a presentations committee, no names attached, so that (and there are attested cases of this) some big names have their talks rejected. But yes, plenary talks often favour outsiders for the reasons I have mentioned above. As I have said elsewhere on this blog site, they provide the mood music for a conference. But talk to any participants and they will tell you enthusiastically of other sessions they have been to, away from the main stage. The VIPs may THINK they are the main attraction, but in a good conference there is no guarantee that this will be the case. – Are VIPs treated better than other speakers? Well that depends. Talk to any frequently invited conference plenarist and they will tell you horror stories of turning up to a conference, doing what they were invited to do (give an opening plenary, for example), and then finding themselves almost completely ignored by the organising committee and everyone else. It can be incredibly lonely out there. Really. Of course this is contrasted with conferences where prominent visitors are treated very well – and it doesn’t feel bad to be in that position at all, of course. But it doesn’t always happen, and anyway it is amazing how quickly, after a big talk, the visiting speaker (rightly)? loses their status and reverts to being just another conference attender. – Some teachers’ associations are run by megalomaniacs. It’s true. Empire builders, people who want to leave a legacy. They are pretty much like those presenters who mix ego and service, but they do it in the wrong proportions. However (and as an aside), it is interesting that many associations only exist because someone like that, someone with a driving force and ambition, kick-started the whole thing. But most teachers’ associations are simply NOT like that – and certainly not ones where I have been asked to speak recently. There is still the ego/service mix, but the balance is generally about right. And make no mistake; the literally hours and hours of time spent by many many volunteers in countries all overt the world, from Brazil to Bangladesh, from Poland to Portugal, from Mexico to, well, anywhere, beggars belief. And guess what! Most teachers are happy for other people to do that (I know I am) since, as for every voluntary organisation I have been involved in, the actual work is done by a small number of committed individuals whose work we are all happy to benefit from. But for anyone who doesn’t like what is happening and thinks the teachers’ associations (and their conferences) are going astray, there are Annual general meetings to go to, and anyone is free to stand for places on committees or propose motions or try to instigate change. It is, of course, easier to stand on the sidelines and moan, but real engagement is a much better option. Or – and this really IS the best option for people who think that things are not being done well – they can start their own association IF they can find people who share their views and IF they are prepared to spend the time. – And that brings me to the last charge levelled against conferences; that they are somehow in league with a bunch of money-grabbing publishers to make huge profits. Well, publishers DO want to make profits, of course. But many of them are also concerned to publish work of a high standard. When it comes to conferences, though, their role becomes incredibly important. They pay a huge amount of money to exhibit (and complain, in my view justifiably, when the exhibition room is badly located, or when the conference has less teachers than they had anticipated). Without them many conferences simply could not afford to take place. The teachers’ associations would go broke. Are they (the publishers) trying to sell us stuff? Yes, of course they are. But we are intelligent enough and have enough integrity not to be hoodwinked by them. Aren’t we? Don’t we? So that’s it. I don’t think conferences, VIPs, publishers or teachers’ associations are run by saints or even in a saintly manner. There’s a lot that could be changed and done better. But with any luck this blog is at least a little bit of a corrective to some of the things that have been said over the last few days. But of course you don’t have to agree. And this would be a good place to say WHY you don’t. It’s been a funny couple of weeks in the parts of Twitterland and the blogosphere that I inhabit. It seems we’ve all been learning lessons recently about how to behave and what to say, whether in 140 characters, or in the more luxurious length of a blogpost. Well, I assume we’ve been learning lessons, but I’m not sure. I guess it’s all about manners. It all started when Gavin Dudeney posted about people’s egos and whether or public thanking for re-tweets was a good idea. That seemed to bruise a lot of heels. Next thing, Karenne Syvester was asking people to vote for the sexiest man in EFL – and she gets hit with the same kind of criticism (laden with gender worries) as Lindsay Clanfield was when he did his ELT guru popularity poll a few months ago. Now, on Jason Renshaw’s blog some Turkish people have been understandably (?) offended by some thoughtless generalisations about their country (and that was after Jason was obliged to take down his ‘sexiest lady’ in ELT because that had offended people too). My points of reference so far are located in the inward-looking world of ELT, but it’s happening out ‘there’ too, with luminaries like Stephen Fry getting upset by tweets and blog comments so that they are tempted to commit twittercide Good grief! What on earth is going on? Of course people can be incredibly bad-mannered ‘live’ in presentations too; talking on mobile phones, walking in and out, chatting to their neighbours, looking menacingly bored (you KNOW what I am talking about! ), and asking hostile questions. But those moments pass in an instant. Tweets, though, can hang around for ages, and be re-tweeted endlessly. God I hope I never get seriously tweckled! I wonder whether the susurrations of upset and bad temper which have characterized the last couple of weeks in this little neck of the twitblog woods have something to do with the strange blend of private-and-public that the social-networking world brings into being. A lot of tweeting is good-natured, jocular and supportive. Many tweets I read tell me about things I did not know about before, or direct me to sites of interest (like @shellTerrell’s tweet which lead me to discover the concept of tweckling – see above). But ‘normal’ tweeting and blogging are public events too (otherwise why have DMs), and perhaps that’s why people get so steamed up. For it may be that while people enjoy talking about who the ‘sexiest’ person is in a private social evening, the same thing looks unattractive (however humorous the intent) in the public sphere; perhaps a good moan about working abroad, laced, as it sometimes is, with a dose of mild racism, is almost allowable in the bar or in your sitting room (though that needs examining too), but it’s less acceptable when it is shouted aloud to a large blogging and tweeting community. Perhaps the egos in my field of English-language teaching seem more contained in conversation than they do when constantly being paraded in front of a network of followers. I have certainly tweeted while listening to a plenary session at a conference and I greatly enjoyed the way that tweeting made me think about what the speaker was saying – and it was fun to see if other people felt the same. Nor am I in any way blameless in all this, of course. I have ego-tweeted with the best of them (just not so often – he said hopefully, clutching at straws). I have expressed opinions which others probably disliked. I have committed all sorts of other breaches of tweet/blog etiquette (if there is or even should be such a thing). I walked out (well slipped out) recently from a famous speaker’s presentation when I thought he was disengaged and was insulting his audience. I have certainly, too, enjoyed the luxury of being able to moan about the country I was living in even whilst loving it with a kind of desperate passion. I moan about my own silly inward-looking land too – but take offence when outsiders make ill-informed comments about it. Perhaps the best answer to unfortunate posts and tweets is just a kind of detached haughtiness – a silence of disinterest, if you will. If that IS the case, I have signally failed by writing this post! Anyway it’s not all bad though. When Sara Hannam posted recently about the distressing fact of being ‘relieved’ of a whole lot of cash by some street mugger, she was inundated by a swathe of supportive and sympathetic comments. There is ‘heart’ in the Twittersphere after all!